Great truck would buy another Cummins 6 speed in a heartbeat. Tows great, semi-comfortable, very reliable only thing that left me by the side of the road was when my radiator got a hole in it, really quick when you need to get out into traffic, 6 speed, cummins diesel, 4x4, added a pac exhaust and engine brakes for towing, has a gooseneck ball, upgraded the steering to the 2009 style way stronger design, front wheel bearings tend to go out once a year (probably cheap replacement part), I do all my own work which is nice, because Dodge lets you do that. Dodge is my go to vehicle. I have had very limited issues. It has been so great, I cannot bring myself to trade for a newer model. Dodge, has always been my go to vehicle, as this is my 3rd Dodge. With it being a older model, it doesn't have heated seats, & the extra features on the radio/cd player, which no longer works anyway. A comfort ride, depends on tire pressure, so always check this before a trip. 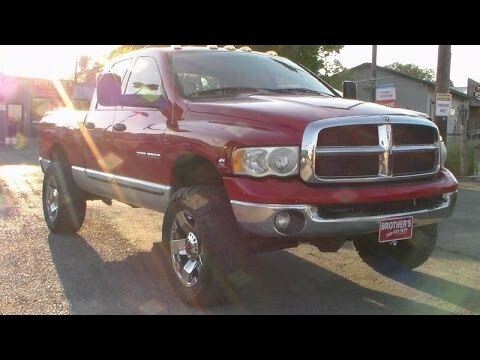 2005 Dodge RAM 2500 with Cummins engine 6sd manual transmission. I have a 2005 Dodge RAM 2500 4WD with the cummins diesel engine. It has the six speed manual transmission. I bought it new and it has 218,000 miles and still running great. It is bare-bones stock. The only upgrade that has been done is I installed lock-outs on the front axle. Other than general maintenance items. Like oil / brake changes it is a maintenance-free truck.